When it comes to designing retail spaces, the sky is not the limit. Safety regulations, commercial certificates, space restrictions, consumer demands, viability and ticking time can outline the parameters of the creative mind. In short, sometimes reality curbs, or rather steers the creative dream into somewhere more familiar. Something more digestible for the consumer’s palette. Fashion has been around for decades and there is nothing more regal than vintage style capable of standing the test of time; long lasting names that hold sway, even today, are revered and remain staples in the fashionista’s wardrobe. House of Monatic, represents just that, having been established all the way back in the 1900’s in Wynberg, Cape Town (previously Monatic Alba). Their long history of beautifully tailored clothing meant that creating a new and more modern clothing line would be as simple as tying their shoelaces. 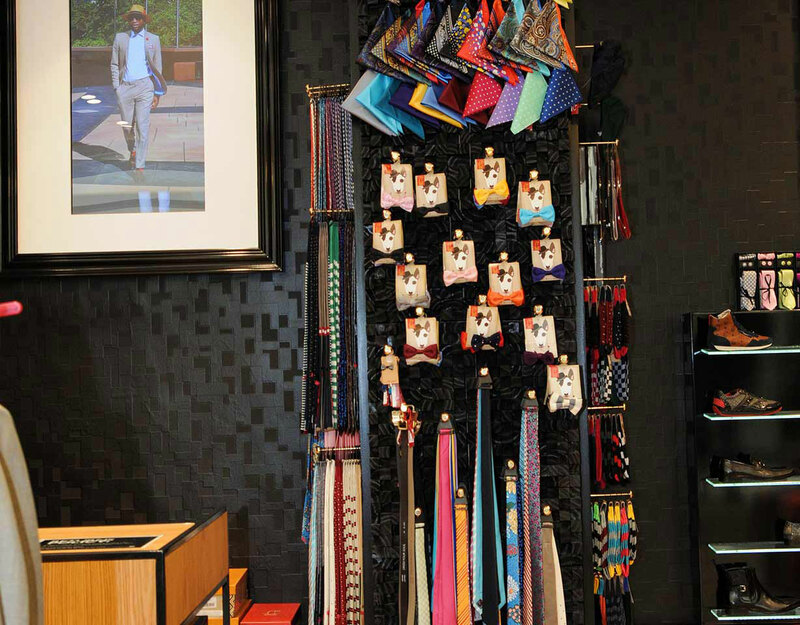 The C Squared line was established by House of Monatic in 2002, catering specifically for men who appreciate bold, chic and stylishly tailored formalwear. C Squared has earned the well deserved reputation as a top South African brand for men. With a collection ranging from suits, jackets, trousers, shoes and shirts all the way to more casual items of clothing and accessories like jeans, t-shirts, socks, and sunglasses. Their on-trend slim cuts exude confidence, energy, style and individuality. The C Squared brand appeals to the young diamonds of today; successful entrepreneurs who wish to look as good as they feel. The mastermind and retail executive behind the brand is Mark Gooding who was a renowned visionary throughout his long career in fashion. Even though he is now retired and travelling the world, his lasting mark can be seen throughout every C Squared store. 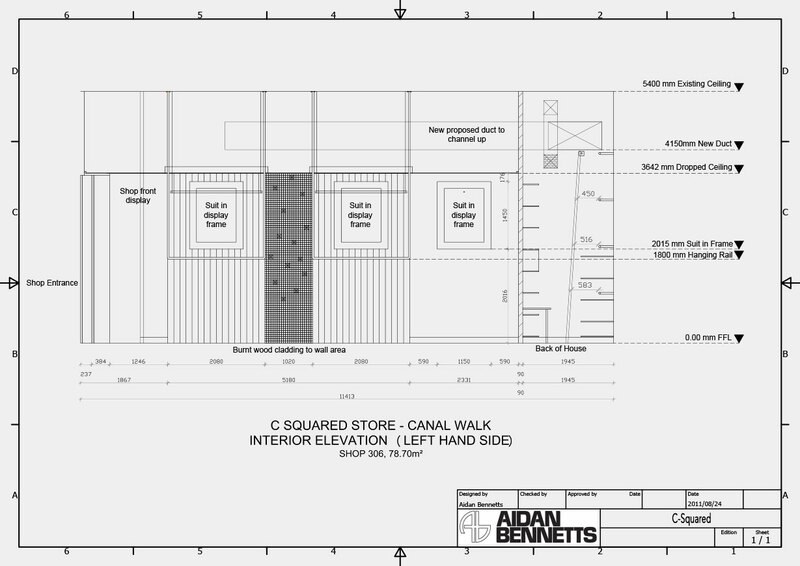 With a glamorous line, but no physical embodiment of it, it was up to Aidan Bennetts to create a store that accurately represented the brand in an eye-catching manner. When it comes to design, the finished product often has a way of appearing simple and perfect, without ever alluding to the difficulties and long hours of arduous work required in order for it to appear as such. This was very much the case when the AB Design studio embarked on the journey of designing the very first C Squared store. Bearing in mind that the market for the brand is the Instagram friendly generation who is, in modern jargon, considered “woke” Aidan and Mark got together and unfolded their vision of creating the perfect marriage of the existing C Squared line and the impeccably luxurious retail space which the brand would go on to become synonymous with. The design process for the flagship store took two months of conceptualisation which is fairly long for a simple retail store, but considering what was at stake and the grandeur that was required to wholly represent the brand, it made sense. Important decisions had to be made; colour palette, choice of materials and an abundance of textures were all explored during this process in order to successfully achieve the harmonious balance of elements that would best complement the C Squared brand and all that it represents. After this onerous process, the very first store opened its doors in Canal Walk Shopping Centre in 2014. 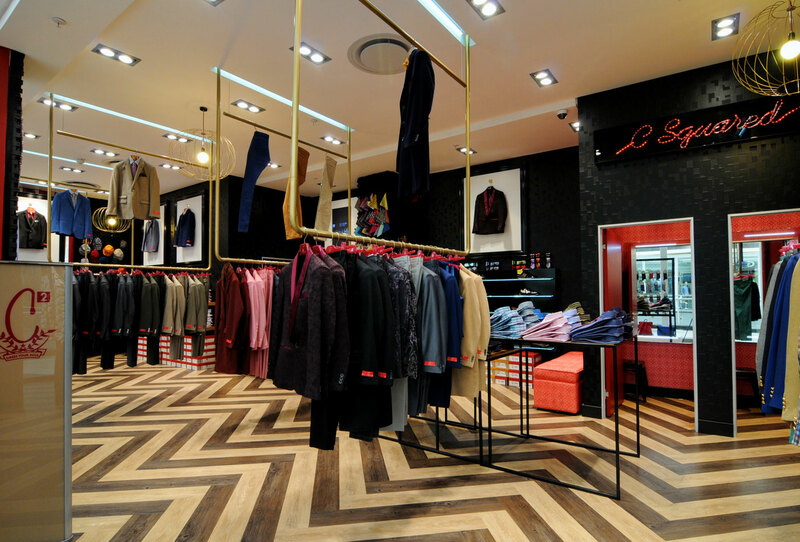 The 100m² store boasts a striking, bespoke two-tone herringbone floor that is just as sharp as the brand itself. With the desire to emphasize this unique detail, it was agreed upon that regular floor-standing clothing rails would detract from the design and any clothing touching the floor would mar the aesthetic. The solution to maintaining the visual appeal of the magnificent herringbone flooring was to suspend the clothing rails from the ceiling – an unusual decision, however, one which saw that clutter was cleared away and the gorgeous patterned flooring could be appreciated in all its splendour. 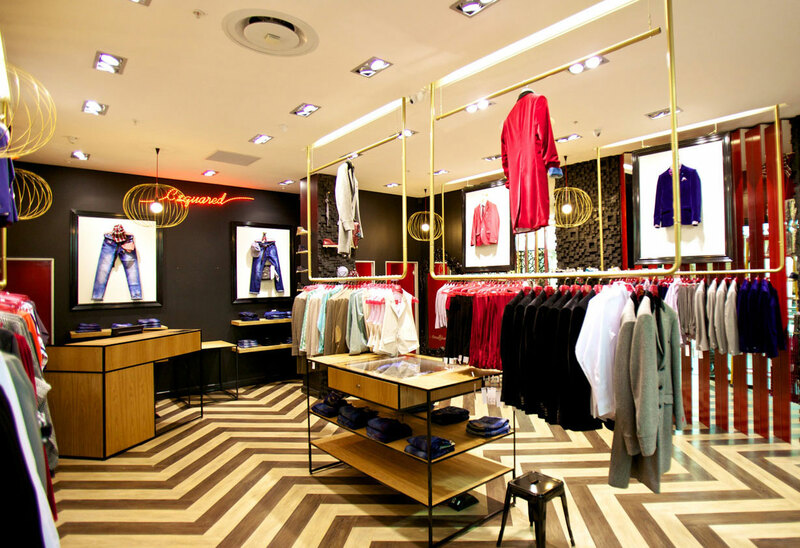 Another trademark feature of the store is the floor to ceiling gold-rimmed triangular fixtures which each hold 45° angled mirrors on its front and back, showcasing and emphasising the signature store colours of red and maroon. In total, there are six C Squared stores countrywide including Rosebank, Gateway, Menlyn Park and an international one in Windhoek. Although the layout may vary from location to location, each of these individual stores maintain the same unique aesthetic which came to life at the flagship store in Canal Walk in 2014. C Squared remains on the pulse of the African Aesthetic, giving opportunities to South African designers to showcase their work. With the influx of international brands coming in, it was difficult for local designers to break into the fashion market which is why C Squared represents such a large movement for South African designers.